Provide comfort for the family of Billie Walston with a meaningful gesture of sympathy. Mrs. Billie Ruth Walston, age 88, of Alexandria, Louisiana, entered eternal rest on Wednesday, March 20, 2019 at Christus St. Frances Cabrini Hospital in Alexandria, Louisiana. Funeral services for Mrs. Walston will be held on Monday, March 25, 2019 at The G.A. Mangun Center in Alexandria, with Sister Vesta Mangun officiating. Private family burial will be on Tuesday at West Lawn Cemetery in Gretna, Louisiana under the direction of Gallagher Funeral Home in Ball, Louisiana. Visitation for Mrs. Walston will be on Monday from noon until 2:00 p.m. at The G. A. Mangun Center. 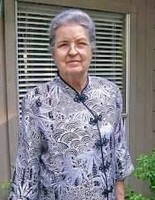 Mrs. Walston was a long time member of The Pentecostals of Alexandria, was a loving mother, grandmother, great-grandmother, sister, and friend. Mrs. Billie loved her family, her church and enjoyed gardening. She will forever be missed by those that knew and loved her. Mrs. Walston is preceded in death by her husband, Loyd Walston and a daughter, Donna Madden. She is survived by two daughters, Linda Crowder (Owen) and Judy Walston; one son, Kenny Walston (Missy); son-in-law, Gary Madden; seven grandchildren, Michelle Fisk (Steven), Kevin Lemke (Rebekah), Jennifer Lemke (Idrees), Lamar Guillot (Stephanie), David Guillot, Aaron Madden and Hannah Kennard (Blake); nine great-grandchildren, Andrea, Thomas, Daniel, Lauren, Abby, Madelyn, Gianna, Eleanor and Jack and one great-great-granddaughter, Lynnen. Friends may post online messages of condolence for the Walston family by visiting www.gallagherfh.com.